It has been a hard slog over the past couple of months working on Curriculum Central and Curriculum Tracker. Finally, I have committed both to the OpenACS CVS repository. Curriculum Central is a system for managing outlines for Courses or Units of Study. The system is targeted at academics that have to revise their course outlines before a course can be offered. Quality assurance is built into the workflow process, which requires approval from a department or school coordinator before the information is published for students to read. Curriculum Central was derived from the problem that students came across when trying to work out what courses they need to complete in order to finish their degree. Students want to know what courses are on offer, as well as any corresponding course requisites. This meant that the School or Department were required to publish a handbook containing a list of course offerings and their dependencies. Maintaining the information in this handbook was not transparent to academics, and therefore inconsistencies crept in. This resulted in misinformed students that were not able to graduate, as they had completed courses that were not core to the degree they were undertaking. Curriculum Central offers a collaborative space for academics to coordinate the curriculum for degree offerings. The information can then be published for students to view. 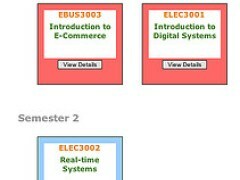 The system offers two view types: course listings; and course maps. 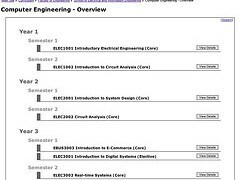 The course listing is a page showing a list of courses that are either core or recommended for a degree stream. The course maps is a graphical representation of the same information. Clicking on a course box will show all prerequisite courses in the course maps view. This allows the student to work out what courses need to be completed before enrolling in a desired course. Curriculum Central also allows the student to export a degree overview from the system as an XML document. The student can then import the XML document into Curriculum Tracker, which is an application designed specifically for students. Curriculum Tracker allows the student to tick off courses that they have completed. This provides students with an overview of their progress through their degree. Furthermore, the course information has been designed to have Graduate Attributes integrated into it. Graduate Attributes are qualities that a student gains from completing a degree. All courses help contribute to these attributes, which include: Communication; Research and Inquiry; Ethical, Social and Professional Understanding; Information Literacy; and Personal and Intellectual Autonomy. By completing a course, a student is able to develop their graduate attributes. 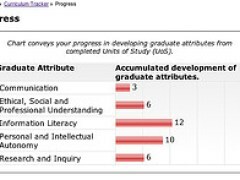 Curriculum Tracker offers a chart for students to track their progress in developing their graduate attributes. The chart allows students to identify their weaker characteristics, which may influence their decision in selecting future courses to enrol in, so that they can build on these weaker characteristics. Therefore, Curriculum Tracker allows students to manage their own personal development through their degrees. Curriculum Tracker is a standalone application, but can be integrated into dotFOLIO quite easily. In fact, Curriculum Tracker offers much more when it is integrated with dotFOLIO. Using dotFOLIO’s clipper feature, students are able to clip work completed for a course to the course outlines in Curriculum Tracker. This provides context for the work completed, as they are related directly with the course that the work was completed for. I believe these additions will make dotFOLIO that much closer to what people envision electronic portfolios to be.